Below is pictured my new favorite cereal: Life, Toasted Cinnamon flavor. 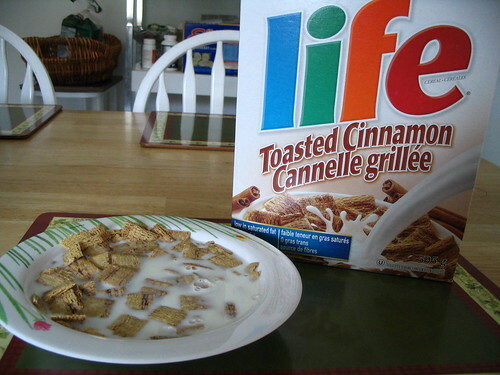 It tastes great and, being Life, is probably a bit healthier than Cinnamon Toast Crunch. posted by Jonathan at 4/06/2009 08:48:00 p.m. I usually eat three slices of bread with Nutella (do you know it?) and a big cup of tea. By sys.out, at 4/07/2009 3:30 a.m. Believe it or not, I have not tried Nutella, though I hear it's scrumptious. I will be sure to try it someday. By Jonathan, at 4/07/2009 8:04 p.m. Your making me hungry. Now I want some honey nut cherios, my current fav, I might try this one next time I go shopping. I can't believe you haven't tried Nutella!? Are you mad? You're are seriously missing out. It's orgasmic, its that danm good. Someday!? Go out and buy it now! By Anonymous, at 5/05/2010 10:56 p.m.